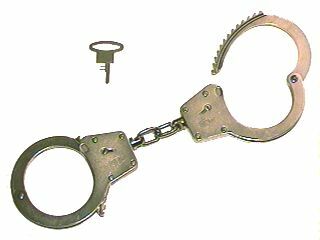 Made in Czechoslovakia, these handcuffs are a decent swing-through double locking handcuff. They use a non-standard key with two long thin wards which probably makes them hard to pick. The keyhole is accessible from both sides of the lock case which reduces security somewhat. The key is stamped out of sheet metal.